Muncie Indiana Central City Redevelopment | Vandewalle & Associates, Inc. 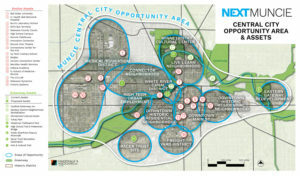 In 2018, a group of Muncie community leaders representing public, private and philanthropic interests formed a Central City Leadership team to solidify and implement a long-term redevelopment and revitalization effort that would harness Muncie’s its place-based assets, along with its anchor institutions of IU Health Ball Memorial Hospital and Ball State University, to create positive economic and quality of life changes. Muncie Indiana is one of many Midwest cities that faced significant economic change and the loss of manufacturing jobs due to recession in the early 2000s—and is one of the three communities that participated in the 2014 ECIRPD tri-city manufacturing economic strategy project. Each city—Muncie, Anderson, and New Castle—emerged from that process with specific roles and catalytic redevelopment projects identified that supported those strategic goals. Vandewalle & Associates worked with the Muncie Central City Leadership Team to identify projects in the Central City that have the greatest market potential. 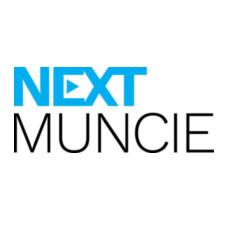 The Leadership Team and V&A also asked Muncie marketing firm to help brand the effort as “Next Muncie” a collection of projects that the public can also embrace as forward-thinking and proof that Muncie’s future can have a different and more sustainable shape than its past.